Scientist at the Institute for Clinical Evaluative Sciences; Assistant Professor at the Institute for Health Policy, Management and Evaluation and the Leslie Dan Faculty of Pharmacy at the University of Toronto; and Scientist at the Li Ka Shing Knowledge Institute at St Michael’s Hospital in Toronto, Ont. Scientist at the Institute for Clinical Evaluative Sciences; Professor at the Institute for Health Policy, Management and Evaluation, the Department of Medicine, and the Leslie Dan Faculty of Pharmacy at the University of Toronto; and Scientist at the Li Ka Shing Knowledge Institute and the Department of Medicine at St Michael’s Hospital. Scientist at the Institute for Clinical Evaluative Sciences and Assistant Professor in the Institute for Health Policy, Management and Evaluation at the University of Toronto and the Department of Family Medicine at McMaster University in Hamilton, Ont. Scientist at the Institute for Clinical Evaluative Sciences; Assistant Professor at the Institute for Health Policy, Management and Evaluation and the Department of Medicine at the University of Toronto; and Associate Scientist at the Li Ka Shing Knowledge Institute and the Department of Medicine at St Michael’s Hospital. Scientist at the Institute for Clinical Evaluative Sciences; Scientist at the Sunnybrook Research Institute; and Professor at the Institute for Health Policy, Management and Evaluation, the Department of Medicine, and the Department of Pediatrics at the University of Toronto. Objective To describe trends in rates of prescribing of high-dose opioid formulations and variations in opioid product selection across Canada. Participants Retail pharmacies dispensing opioids between January 1, 2006, and December 31, 2011. 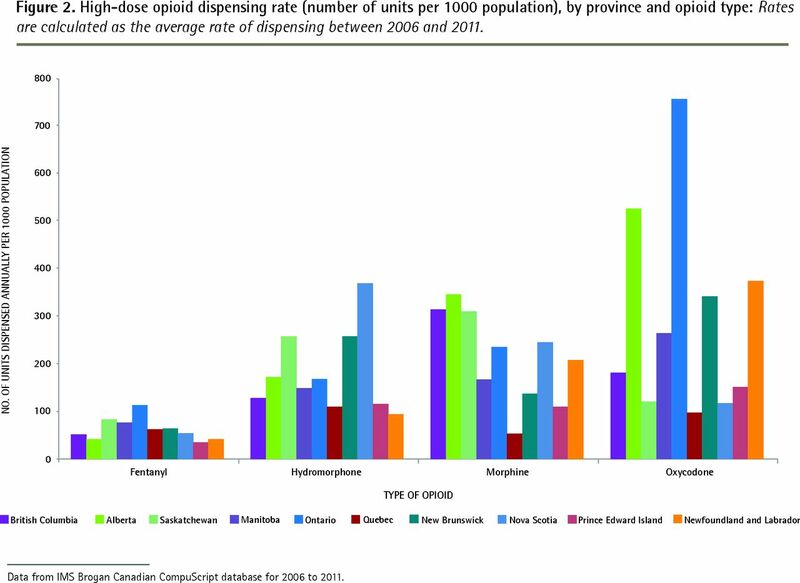 Main outcome measures Opioid dispensing rates, reported as the number of units dispensed per 1000 population, stratified by province and opioid type. Results The rate of dispensing high-dose opioid formulations increased 23.0%, from 781 units per 1000 population in 2006 to 961 units per 1000 population in 2011. Although these rates remained relatively stable in Alberta (6.3% increase) and British Columbia (8.4% increase), rates in Newfoundland and Labrador (84.7% increase) and Saskatchewan (54.0% increase) rose substantially. Ontario exhibited the highest annual rate of high-dose oxycodone and fentanyl dispensing (756 tablets and 112 patches per 1000 population, respectively), while Alberta’s rate of high-dose morphine dispensing was the highest in Canada (347 units per 1000 population). Two of the highest rates of high-dose hydromorphone dispensing were found in Saskatchewan and Nova Scotia (258 and 369 units per 1000 population, respectively). Conversely, Quebec had the lowest rate of high-dose oxycodone and morphine dispensing (98 and 53 units per 1000 population, respectively). Conclusion We found marked interprovincial variation in the dispensing of high-dose opioid formulations in Canada, emphasizing the need to understand the reasons for these differences, and to consider developing a national strategy to address opioid prescribing. Several Canadian provinces have adopted strategies to improve opioid prescribing, including prescription monitoring programs18–22 and restricted reimbursement of opioids on publicly funded drug plans. However, little is known about the effectiveness of these efforts, particularly their influence on high-dose opioid use. One study published in 2011 reported variation in the defined daily dose of opioids dispensed provincially, and demonstrated increasing trends of “strong” (non-codeine) opioid dispensing in Canada and interprovincial differences in dispensing of individual opioids.23 However, this study did not explore whether dispensing of high-dose opioid formulations—which are particularly concerning from a safety perspective—differs among provinces and opioid type. We sought to describe trends in the prescribing of high-dose opioid formulations, and to investigate the types of opioids most commonly prescribed in high-dose formulations across Canada. We conducted a population-based, cross-sectional study of all prescriptions for high-dose formulations of morphine, oxycodone, hydromorphone, and transdermal fentanyl dispensed by retail pharmacies in Canada between January 1, 2006, and December 31, 2011. High-dose opioid formulations were defined as tablets or transdermal patches that would lead to a daily dose exceeding 200 mg MEQ when taken twice daily. Specific thresholds were 100 mg, 80 mg, 20 mg, and 75 µg/h for morphine, oxycodone, hydromorphone, and fentanyl, respectively. We excluded opioids that are rarely prescribed (ie, anileridine, levorphanol, pentazocine, and propoxyphene), as well as methadone because it is principally used to treat opioid addiction rather than chronic pain in Canada. We also excluded prescriptions for codeine and meperidine because they do not exist in a single-tablet formulation that would result in a daily dose exceeding 200 mg MEQ when taken at recommended dosing intervals. We obtained data on all outpatient prescriptions for opioids using the IMS Brogan Canadian CompuScript database, which captures data from a representative panel of Canadian pharmacies, and is used regularly for research purposes.23,24 Outpatient prescriptions are those filled by retail pharmacies for patients with valid prescriptions from physicians licensed to practise in Canada. Drug prescription and unit (tablet or transdermal patch) volumes are identified using drug identification numbers and are projected monthly by province using geospatial methods that incorporate the number of pharmacies in a given region, the distance between IMS-captured and uncaptured pharmacies, and the size of the pharmacies.25 The projected volumes are representative of all Canadian pharmacies and undergo ongoing monitoring of projection quality. Opioid dispensing rates were calculated annually between 2006 and 2011 using provincial population estimates and projections from the 2006 Statistics Canada census,26 and were reported as the number of units dispensed per 1000 population, stratified by province and opioid type. Over the 6-year study period, a total of 180 889 223 units of high-dose opioid formulations were dispensed across Canada, and the rate of high-dose opioid dispensing increased by 23.0%, from 781 units per 1000 population in 2006 to 961 units per 1000 population in 2011 (Figure 1). Further, although high-dose opioid dispensing rates remained relatively stable in Alberta (6.3% increase) and British Columbia (8.4% increase), rates in several provinces rose substantially over the study period. In particular, in Newfoundland and Labrador the rate of high-dose opioid dispensing increased 84.7%, from 507 units per 1000 population in 2006 to 937 units per 1000 population in 2011. High-dose opioid dispensing rate (number of units per 1000 population), by province and year (2006–2011): Rates are presented nationally and stratified by province. Data from IMS Brogan Canadian CompuScript database by year between 2006 and 2011. Overall, high-dose opioid dispensing rates varied more than 3-fold by province, with Ontario and Alberta exhibiting the highest annual dispensing rates (1382 and 1133 high-dose opioid units per 1000 population in 2011, respectively) and Quebec and Prince Edward Island exhibiting the lowest annual rates (368 and 556 high-dose opioid units per 1000 population in 2011, respectively). The type of high-dose opioid also varied. Almost half of all units of high-dose opioid formulations dispensed nationally during the study period were oxycodone tablets (n = 88 461 884, 48.9%), followed by morphine tablets (n = 43 754 797, 24.2%), hydromorphone tablets (n = 32 538 465, 18.0%), and fentanyl patches (n = 16 134 077, 8.9%). However, the opioid of choice differed dramatically among the provinces (Figure 2). In particular, annual prescribing of high-dose oxycodone varied almost 8-fold, ranging between 98 units per 1000 population in Quebec and 756 units per 1000 population in Ontario. Ontario also exhibited the highest annual rate of high-dose fentanyl dispensing (112 units per 1000 population), but had comparatively moderate rates of hydromorphone and morphine dispensing. Conversely, Alberta’s rate of high-dose morphine dispensing was the highest in Canada (347 units per 1000 population), and its rate of high-dose oxycodone dispensing was second only to Ontario (526 units per 1000 population); however, its high-dose fentanyl dispensing rate was among the lowest in the country (41 units per 1000 population). Of interest, 2 of the highest rates of high-dose hydromorphone dispensing were evident in Saskatchewan (258 units per 1000 population) and Nova Scotia (369 units per 1000 population), both of which had among the lowest rates of high-dose oxycodone dispensing (122 and 117 units per 1000 population, respectively). High-dose opioid dispensing rate (number of units per 1000 population), by province and opioid type: Rates are calculated as the average rate of dispensing between 2006 and 2011. Data from IMS Brogan Canadian CompuScript database for 2006 to 2011. In this population-based study spanning 6 years, we found that, on average, more than 30 million tablets or patches of high-dose opioids were dispensed in Canada annually, despite recommendations to avoid high-dose therapy in most patients. 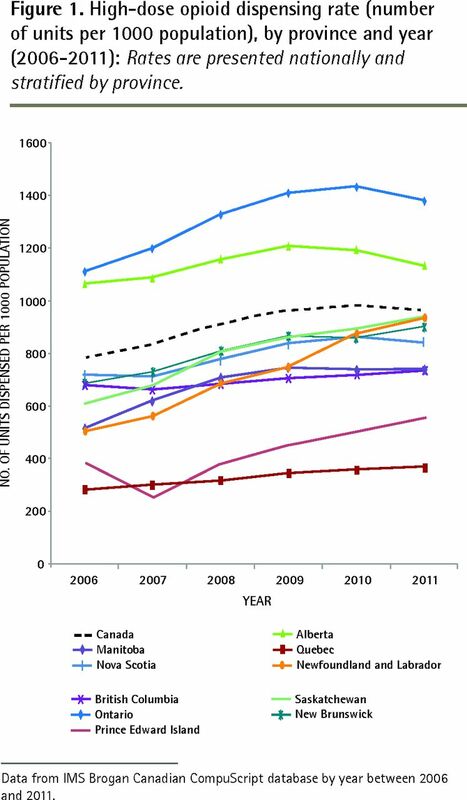 Of interest, the per capita rate of high-dose opioid dispensing increased steadily in Canada between 2006 and 2008 before plateauing in 2009 and 2010, which aligns with the release of Canadian and American guidelines.11,12 Ongoing monitoring of these trends over the coming years will determine whether this change is sustained. We observed a 3-fold provincial variation in the per capita rate of prescribing of high-dose opioid formulations across Canada. In particular, rates of high-dose opioid dispensing were consistently low in Quebec and high in both Alberta and Ontario, with the higher rates being driven largely by prescriptions for oxycodone. Similarly, we also observed substantial variation in the type of opioids prescribed in high-dose formulations, with high-dose oxycodone generally being dispensed in the highest volumes. Although fentanyl appears to be dispensed in the lowest volumes, these rates should be interpreted cautiously because each transdermal patch is used for 72 hours, while opioids in tablet form are typically used twice daily. Therefore, if each high-dose transdermal patch dispensed was approximately equivalent to 6 high-dose tablets of other opioids, the volume of fentanyl patches dispensed over our study period (n = 16 134 077) would be equivalent to more than 96 million tablets, which exceeds the number of high-dose oxycodone tablets dispensed over this time. There are several potential explanations for the cross-provincial differences in high-dose opioid prescribing, including variation in coverage of opioids on public drug plans, differences in the prevalence of pain, and differential marketing on the part of pharmaceutical companies. For example, Prince Edward Island, Newfoundland and Labrador, and British Columbia are the only 3 provinces that list long-acting hydromorphone as a restricted benefit (that is, one requiring prior authorization) on their public drug formularies, and these provinces have the lowest rates of high-dose hydromorphone dispensing in Canada. Similarly, Ontario and Alberta historically placed few restrictions on the prescribing of long-acting oxycodone, and have the highest rates of high-dose oxycodone dispensing, while Prince Edward Island, British Columbia, and Nova Scotia restrict reimbursement for this formulation to patients who meet strict criteria for coverage and these provinces have among the lowest rates of high-dose oxycodone dispensing. However, there are provinces that do not follow these patterns. For example, Saskatchewan covers long-acting oxycodone without restriction on their public drug formulary, yet has one of the lowest rates of high-dose oxycodone dispensing. Further, Quebec exhibited very low rates of high-dose opioid dispensing overall, despite generally unrestricted coverage for all opioids through their public drug program. These findings are consistent with literature surrounding the effects of prior-authorization mechanisms, suggesting regional differences in the effects of restricted reimbursement policies.27,28 Therefore, although provincial opioid reimbursement policies are likely to have influenced some of the observed prescribing trends, other factors must also be at play. Several limitations of our analyses merit discussion. First, the data represent prescriptions dispensed from retail pharmacies, and thus do not include opioids dispensed in hospitals or other acute care settings. Therefore, the volume of prescribing of high-dose opioid formulations in inpatient settings is not known to us, although the total volume of such prescriptions is likely to represent a small fraction of all opioid use and is unlikely to have an important effect on overall trends. Second, our study does not include trends in methadone prescribing because methadone is principally used to treat addiction in Canada. A recent study by Fischer et al found that methadone prescribing rates were similar across Canada, with the exception of Prince Edward Island where methadone maintenance treatment of opioid addiction has been expanded in recent years.23 Third, it is possible that the projected nature of the data and the variation in capture rates across provinces introduces some error into the opioid volume estimates. However, the IMS CompuScript database applies complex, geospatial projection methods to obtain prescription volume estimates that are representative at the provincial and national levels. Finally, our study was designed to report trends in the volume of high-dose formulations dispensed, and thus cannot determine whether the observed increases were influenced by expanded use of high-dose opioids for new patients, higher prescribed doses to existing patients, or a combination of these factors. Further, because of this design, our findings do not describe individuals prescribed high daily doses of opioids provided through multiple low-dose tablets. Although guidelines suggest that high-dose opioid formulations might be appropriate in some instances, there is little evidence to support this practice. On the other hand, high-dose opioid prescribing is clearly associated with increased risk of fracture, trauma, overdose, and death. Our findings suggest that use of high-dose opioids is widespread in Canada and highlight the profound regional variation in prescribing of high-dose formulations. This has important clinical and policy consequences. Clinical guidelines are increasingly establishing upper dose thresholds for opioids in patients with chronic noncancer pain, and a growing body of evidence has described the relationship between increasing opioid dose and risk of overdose and death. Indeed, daily doses exceeding 100 mg of morphine (or equivalent) have been associated with a 9-fold increased risk of overdose,13 and a doubling of the risk of opioid-related death compared with lower doses.15 Therefore, the considerable variation in the prevalence of use of high-dose opioid formulations across Canada underscores the need for further research on both the determinants and the consequences of this variation, and emphasizes the urgent need for a unified national effort to promote safe opioid prescribing. This study was supported by a grant from the Ontario Ministry of Health and Long-Term Care (MOHLTC) Drug Innovation Fund and the Institute for Clinical Evaluative Sciences, a non-profit research institute sponsored by the Ontario MOHLTC. The opinions, results, and conclusions reported in this paper are those of the authors and are independent from the funding sources. No endorsement by the Institute for Clinical Evaluative Sciences or the Ontario MOHLTC is intended or should be inferred. The statements, findings, conclusions, views, and opinions contained and expressed in this publication are based in part on data obtained under licence from IMS Health Canada Inc concerning the following information services: IMS CompuScript, data period 2006–2011. All rights reserved. The statements, findings, conclusions, views, and opinions contained and expressed herein are not necessarily those of IMS Health Canada Inc or any of its affiliated or subsidiary entities. Ms Gomes had full access to all the data in the study and takes responsibility for the integrity of the data and the accuracy of the data analysis. Canada and the United States have the highest prescription opioid consumption in the world, and use continues to increase dramatically. Until recently, guidelines and product monographs provided no recommended maximum dose, and opioids were marketed as having no upper dose threshold, despite scant evidence of safety or effectiveness at high doses. Mounting evidence shows high doses of opioids might be particularly dangerous, both to the patient receiving the prescription and to others who might consume these medications. This research sought to describe trends in the prescribing of high-dose opioid formulations, and to investigate the types of opioids most commonly prescribed in high-dose formulations across Canada. This population-based study spanning 6 years found that, on average, more than 30 million tablets or patches of high-dose opioids were dispensed in Canada annually, despite recommendations to avoid high-dose therapy in most patients. The per capita rate of high-dose opioid dispensing increased steadily between 2006 and 2008 before plateauing in 2009 and 2010, which aligns with the release of Canadian and American guidelines. A 3-fold provincial variation in the per capita rate of prescribing high-dose opioid therapy formulations was observed. Le Canada et les États-Unis ont la plus forte consommation d’opiacés sous ordonnance du monde, et l’utilisation de ces substances continue d’augmenter de façon dramatique. Jusqu’à récemment, ni les directives de pratique ni les monographies de ces produits n’indiquaient les doses maximales, et on les présentait comme n’ayant aucune dose maximale, malgré le peu d’évidence de leur innocuité ou de leur efficacité à des doses élevées. Il y a de plus en plus de preuves que les fortes doses d’opiacés pourraient être particulièrement dangereuses, tant pour les patients à qui on les prescrit que pour les autres consommateurs de ces médicaments. Cette étude visait à décrire les tendances actuelles dans la prescription de fortes doses d’opiacés et à vérifier les types d’opiacés les plus souvent prescrits en doses élevées au Canada. Dans cette étude de nature démographique échelonnée sur 6 ans, on a observé qu’en moyenne, plus de 30 millions de comprimés ou de timbres médicamenteux contenant de fortes doses d’opiacés étaient distribués annuellement au Canada, et ce, malgré le fait qu’il est recommandé d’éviter les traitements à fortes doses pour la plupart des patients. Entre 2006 et 2008, le taux per capita pour la distribution d’opiacés à fortes doses a augmenté régulièrement pour atteindre un plateau en 2009 et 2010, ce qui concorde avec le moment où les directives canadiennes et américaines ont été émises. On observait que le taux per capita de prescriptions de fortes doses d’opiacés avait triplé à l’échelle des provinces. All authors contributed to the concept and design of the study and to data gathering, analysis, or interpretation. Ms Gomes prepared the manuscript for submission, and the other authors revised the article for important intellectual content. All authors approved the final manuscript for submission. Dr Mamdani has received honoraria from Boehringer Ingelheim, Pfizer, Bristol-Myers Squibb, and Bayer. None of the other authors has any conflicts of interest to declare. Opioid consumption motion chart. Madison, WI: Board of Regents of the University of Wisconsin System; 2012. Available from: http://ppsg-production.heroku.com/chart. Accessed 2014 Jul 28.
. Prescribing of opioid analgesics and related mortality before and after the introduction of long-acting oxycodone. CMAJ 2009;181(12):891-6.
. Trends in long-term opioid therapy for chronic non-cancer pain. Pharmacoepidemiol Drug Saf 2009;18(12):1166-75.
. Opioid analgesics and rates of fatal drug poisoning in the United States. Am J Prev Med 2006;31(6):506-11.
. Trends in opioid use and dosing among socio-economically disadvantaged patients. Open Med 2011;5(1):e13-22.
. Research gaps on use of opioids for chronic noncancer pain: findings from a review of the evidence for an American Pain Society and American Academy of Pain Medicine clinical practice guideline. J Pain 2009;10(2):147-59. OxyContin. Pickering, ON: Purdue Pharma; 2009. [product monograph].
. Cancer pain management. Current strategy. Cancer 1993;72(11 Suppl):3393-415.
. Management of cancer pain: ESMO clinical practice guidelines. Ann Oncol 2012;23(Suppl 7):vii, 139-54. Interagency guideline on opioid dosing for chronic non-cancer pain: an educational pilot to improve care and safety with opioid treatment. Olympia, WA: Washington State Agency Medical Directors’ Group; 2007.
. Clinical guidelines for the use of chronic opioid therapy in chronic noncancer pain. J Pain 2009;10(2):113-30. National Opioid Use Guideline Group. Canadian guideline for safe and effective use of opioids for chronic non-cancer pain. Hamilton, ON: McMaster University; 2010. Available from: http://nationalpaincentre.mcmaster.ca/opioid. Accessed 2014 Jul 28.
. Opioid prescriptions for chronic pain and overdose: a cohort study. Ann Intern Med 2010;152(2):85-92.
. Association between opioid prescribing patterns and opioid overdose-related deaths. JAMA 2011;305(13):1315-21.
. Opioid dose and drug-related mortality in patients with nonmalignant pain. Arch Intern Med 2011;171(7):686-91.
. Opioid dose and risk of road trauma in Canada: a population-based study. JAMA Intern Med 2013;173(3):196-201.
. Opioid analgesics and the risk of fractures in older adults with arthritis. J Am Geriatr Soc 2011;59(3):430-8. Nova Scotia Prescription Monitoring Program. Halifax, NS: Prescription Monitoring Board; 2013. [website]. Available from: www.nspmp.ca. Accessed 2014 Jul 28. The Prescription Review Program. Regina, SK: Government of Saskatchewan; 2012. Available from: http://formulary.drugplan.health.gov.sk.ca/PDFs/ThePrescriptionReviewProgram.pdf. Accessed 2014 Jul 28. PharmaNet. Vancouver, BC: Government of British Columbia; 2007. [website]. Available from: www.health.gov.bc.ca/pharmacare/pharmanet/netindex.html. Accessed 2014 Jul 28. College of Physicians and Surgeons of Alberta. Triplicate Prescription Program. Edmonton, AB: College of Physicians and Surgeons of Alberta; 2012. Available from: www.cpsa.ab.ca/Services/Triplicate_Prescription_Program/TPP_Overview.aspx. Accessed 2014 Jul 28. OxyContin Task Force final report. St John’s, NL: Government of Newfoundland and Labrador; 2004.
. Differences and over-time changes in levels of prescription opioid analgesic dispensing from retail pharmacies in Canada, 2005–2010. Pharmacoepidemiol Drug Saf 2011;20(12):1269-77.
. Reformulation of controlled-release oxycodone and pharmacy dispensing patterns near the US-Canada border. Open Med 2012;6(4):e141-5. IMS Health. IMS Audit Training. 2013. [website]. Available from: http://canadaelearning.imshealth.com/cs/index.html. Accessed 2014 Jul 28. Population and dwelling counts, for Canada, provinces and territories, and census subdivisions (municipalities), 2006 and 2001 censuses. Ottawa, ON: Statistics Canada; 2006.
. Medicaid prior authorization and controlled-release oxycodone. Med Care 2008;46(6):573-80.
. Impact of prior authorization on the use and costs of lipid-lowering medications among Michigan and Indiana dual enrollees in Medicaid and Medicare: results of a longitudinal, population-based study. Clin Ther 2011;33(1):135-44.
. Chronic pain at ages 12 to 44. Health Rep 2010;21(4):53-61.
. The impact of sampling and measurement on the prevalence of self-reported pain in Canada. Pain Res Manag 2003;8(3):157-63.
. The prevalence of chronic pain in Canada. Pain Res Manag 2011;16(6):445-50.
. The danger of imperfect regulation: OxyContin use in the United States and Canada. Int J Risk Saf Med 2011;23(4):233-40.
. Representations of OxyContin in North American newspapers and medical journals. Pain Res Manag 2011;16(4):252-8.